To anyone serious about tree pruning, I would strongly recommend reading Alex Shigo’s Tree Pruning or A New Tree Biology. He makes in-depth recommendations for pruning based on his years of research into the healing of trees after injury and pruning, and explains and shows why the location of pruning cuts is so important. His basic premise is that trees compartmentalize damaged wood and infections (he writes, “humans heal, trees compartmentalize”). When making pruning cuts, it’s important to preserve the “protection zone” (the point at which the tree is most able to produce compounds to suppress the growth of fungus and bacteria) at the base of the branch. Flush cuts, that is cuts that take away any of the branch collar, remove part or all of the protection zone and leave the tree open to infection. The radical pruning that’s necessary for an old apple tree, will involve so many cuts that working with the tree’s ability to compartmentalize infection will be extremely important. 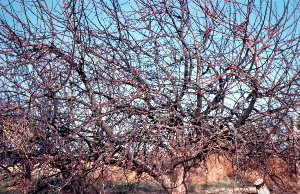 One other thing, relevant to that part of the country: these orchard pruning techniques do NOT work on all trees. It is common in places like Wenatchee and Yakima to see shade and ornamental trees pruned like orchard trees, as orchard workers look to make a few extra dollars. These people ruin the shade and ornamental trees in the area when they go out and prune everything into an orchard tree. I believe it could be taken as up to 30% and/or no more than 30%. The reason is what was mentioned about water sprouts[my term], which are vigorous vertical growing branches which produce excessive foliage growth but no fruit. Pruning is definitely an art. Over 30% and the tree is overly stressed. It’s interesting that while on many mountain hiking trips over the decades, I’ve run across many apple trees from old long abandoned homesteads which hadn’t been pruned in many decades. Their production was always fine, even without irrigation. I had to assume they were tapped into the surrounding chaparral and wild trees through the underground mycorrhizal grid. In the old days of course they would have been mostly the standard trees. But they always produce and I’ve wondered maybe if some pruning does take place accidentally when the bears came around and broke off small branches and twigs as they gleaned for apples. There was an interesting article last fall 2014 about the wild apple forests of Kazakhstan. Clealy no pruning there, but one wonders how it does really work in the wild. I have to admit, this is one destination place I have wanted to visit because of the Apple forests. I have a question about sealants. If one is topworking a tree and adding bark grafts should one seal the entire cut surface, only around the grafts, or not at all and hope the wrapping is sufficient? Presumably with a cleft graft one would still want to at least cover the split with something. Previous Previous post: A 19th Century Garden Hero: Hero or villain today?